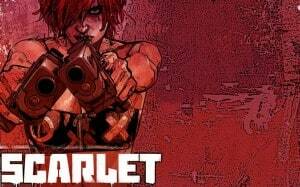 Marvel's Scarlet TV Series Coming to HBO | Nerd Much? Marvel Comics creator Brian Michael Bendis announced today that a Scarlet TV series, based on his work of the same name, is in development at HBO. Bendis went on to note that development is in its earliest stage. The comic series was first published in 2010, and it follows the tale of Scarlet Rue, a Portland, Oregon woman who sparks a second American revolution. The comic can be compared to The Punisher in its tone, according to Deadline. This will be Bendis’s third comic book series to get its own TV series, following PlayStation’s Powers and Netflix’s Jessica Jones. At some point, we have to begin wondering if he’s crafting his comic books specifically with television in mind, or if he just has a knack for writing good stories that TV watchers would probably love. We’ll probably learn more about the Scarlet TV series soon, but for now, it sounds like it’s still in the planning stage. Stay tuned to Nerd Much on Twitter and Facebook for the latest updates.